The Purple Muse: You're My Pot of Gold! Hello creative friends! Today I would like to share with you a card I made for a few challenges. I used the free St Patricks Day cut from Cricut Craftroom. I think this is my favorite "pot o gold" cut. I love the layers and the inset clover/shamrock. I embellished the gold coins with Stickles (of course) as well as the "sparkles". The circle layer is dry embossed with Cuttlebug's Argyle folder and the green layer is embossed with Darice's St Patrick's folder. I used a sentiment stamp from Scrappy Moms' Spring Fling set. Darling card and I agree this is a great cut. I love all the details you added. Thank you for playing at Exploring Cricut and More!! Great card-Love that embossing folder and the gold coins-Thanks for joining us at Exploring Cricut & More and FCCB this week! Fabulous card! Love the embossing!! Thanks for joining us at DCD this week! I love the pot of gold cut and your sentiment. This is such a cute card. Thank you for joining us at BBTB2. Love your card and thanks for joining us at Exploring Cricut and More. I love your layout - Great card! Thanks for playing along with us at Exploring Cricut & More! Really love your card! Thanks for joining the BBTB2 challenge! Thanks for entering our Make Something Monday Challenge! 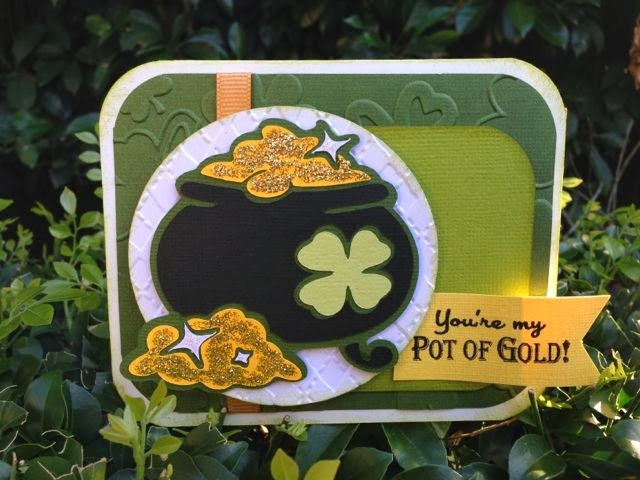 I agree, that is an awesome pot of gold cut file! I also love how you photographed your card outside in the foliage! I hope you'll join us again next week! This is a great card! Thanks for playing the sketch challenge at FCCB.